POWERGRIP HD is a true "strip/street" competition clutch system that can handle the rigors of weekend racing and spirited street driving. This system has the same components as standard POWERGRIP above with the exception that the disc friction surfaces are both sintered metallic. Sintered metallic provides a degree of slippage on vehicle launch to prevent the violent and uncontrollable engagement characteristics of paddle type metallic discs. This firm consistent engagement is easy to control. Some chatter is likely on engagement with rear gearing less than 3.73 in street applications. 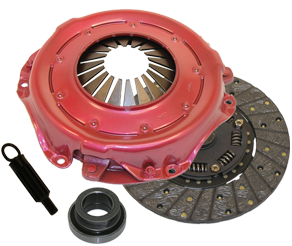 Each set includes the pressure plate, clutch disc, release bearing, and alignment tool unless otherwise noted. Use Powergrip HD for power levels to 650 horsepower, or lower powered vehicles that see frequent track duty.